We are not talking about Godzilla, King of the Monsters (56) with Raymond Burr here, this one is Gojira (54), English subtitles and all—and it played at the Nuart in West LA from May 14-27 of 2004. Thanks to Rialto Pictures for this one. Bless 'em; they do know their stuff over there. Brad wasn’t free and he asked if I would join Forrest J Ackerman (renowned editor of Famous Monsters of Filmland) at this momentous event in his stead. Far be it from me to say no to Brad, let alone Godzilla so off we went. I asked my current roomie, indie filmmaker Therese Gehri, to join us. I also asked Ron Garmon, as I wanted a bodyguard. Two women and a gentleman of advanced age (Forry is 88 now folks! Quite spry but 88 nonetheless!) are too easy a target and the Nuart is in a part of the West Side slung under the 405 Freeway that I’m not very comfortable with anymore. One night a couple of years ago some dude swiped my handbag and knocked me into the street in front of the theatre so I no longer go there alone. The fifth member of our merry band was a fellow named Douglas whom I don’t know but who sat in my car anyway. He got us popcorn though so it’s cool. And here we all sat ‘way down in front and yawned through about 15 minutes of trailers which no one else in the theatre bothered to watch because most of them were hunting for the envelope that had been taped under a seat with a card that said “You Won” a free DVD of Bubba Ho-tep (with Bruce Campbell and Ossie Davis, available from MGM). But at length—he came. The theatre’s floor shuddered with each step, its walls shook with his roar and the crowd fell silent as this masterpiece of science fiction rolled on the big screen once more. This to me is pure silver screen magic: an elegant, intelligent film that provokes in-depth discussion and debate 50 years after its premier. Also the overall pain, cynicism and panic of the Japanese people when faced with the possibility of destruction and evacuation again so soon after the B-29 “Bockscar” dropped “Fat Man” on Nagasaki is pretty much out the window in the US cut. And there’s something that I saw last night that I missed in both of the previous cuts I’ve seen on the small screen and it’s changed the whole film for me. It’s a 20 second cut of Godzilla in profile during his final stomping of Tokyo. He’s shot from below and he’s panting. He’s panting like a cat will—with his mouth open and his throat palpitating and he’s very, very still. I mean he is scared witless and thrashing about trying to get out of what he’s gotten into. And then he got dead due to the selfless sacrifice of Dr. Serizawa. A point not often, if ever discussed by the way. Here’s a brilliant, young scientist in Japan who creates something in the Oxygen Destroyer that is potentially as horrific as the H-bomb. He knows what he has and burns all his notes before agreeing to use the weapon in Japan’s defense. The coup d’e tat comes when he hoodwinks everyone into thinking he will go underwater to set the thing and then return to the ship. He doesn’t. Instead, he sticks around to release the weapon’s power himself and there he stays, another skeleton along with Godzilla and every fish off the East Coast of Japan. Something not in the US version with Raymond Burr is the lecture at the close of the film from Emiko’s father, Dr. Kyohei Yamane (Takashi Shimura) [paraphrased], “I can’t believe that Godzilla is the last of his kind. 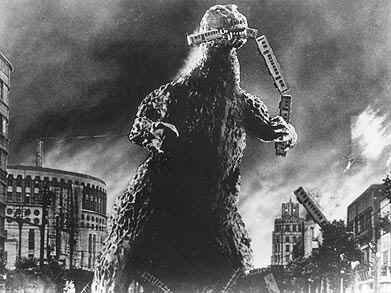 As long as we keep testing H-bombs, these creatures will continue to appear.” The sequel Godzilla is not the same fellow. That should be obvious from the look of him anyway, but there are still those who think it was just a change in the costume and bellow about reanimating a skeleton. 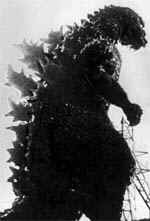 I have participated in discussions on Godzilla where it is agreed that he is no doubt the result of ‘the bomb’ as well as a virtual embodiment of the loss of a people in the wake of unspeakable violence—but I never considered the possibility that the king of the monsters was about to wet his scaly pants. Nor have I considered the implications of Serizawa’s Kamikaze approach to weapon making. And then there’s Linaweaver who has skewed my view yet again, by reminding me of the Tokyo firestorms which are so often forgotten in the wake of the bombs. We now have a few more points to ponder and I’m expecting a lot of mail on this one. After the applause and the house lights came up, we thanked our host for the seats and Forry took us all to dinner at Dolores’ Restaurant, a little ways down the block. We disbanded just before midnight, Forry to the new bungalow, Douglas to Glendale, Garmon to the Red Line and Therese and I to North Hollywood where she slept the sleep of the just and I sat up all night listening to blues and waiting for the house to get stepped on. be able to sit in a darkened theatre and and experience wonder with him.